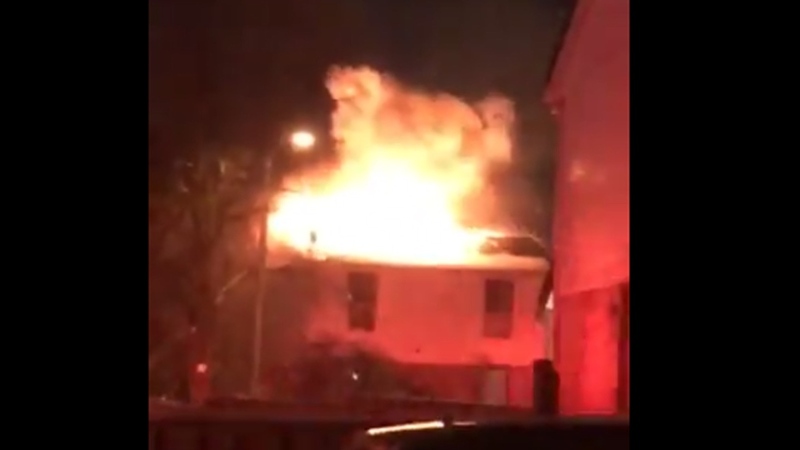 No injuries were reported after a two-alarm fire broke out at a home in Malvern Sunday night. The fire started at a house on Snowball Crescent, in the area of Sheppard Avenue and Markham Road, at around 7:15 p.m. In a tweet, Toronto Fire Services said they were battling a fire in the upper floor and attic of a home. Toronto police initially said several homes were affected, but Toronto Fire later said that just one home was involved. The homeowner told CP24 at the scene that he had actually been asleep when the fire started. Luckily, neighbours spotted the flames from across the street and came to alert him. Images sent to CP24 by viewers at the scene showed heavy smoke and flames dancing on the roof of a home. Toronto Fire said they got the blaze under control just before 8:40 p.m. and that there were no injuries. However fire crews had to rotate due to the extreme cold, which quickly froze much of the water used to fight the blaze. It’s still not clear what caused the fire. Firefighters remained at the scene late Sunday night to put out hot spots.